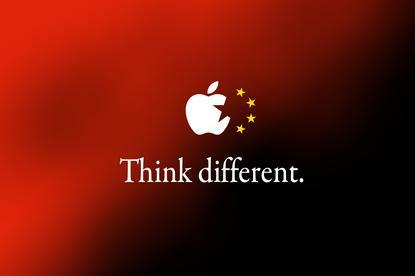 A quarter after Apple debuted as the number two wearables vendor worldwide, Chinese vendor Xiaomi finished the third quarter of 2015 (3Q15) as a strong contender for this position. 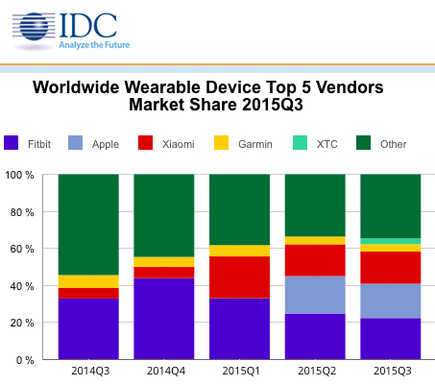 Similarly, newcomer XTC beat out Samsung as the world's number five wearables vendor. According to IDC, total shipment volume for the quarter came to 21.0 million units, up 197.6 percent from the 7.1 million units shipped in 3Q14. “The early stages of the wearables market have led to tight competition among the leading vendors, and Chinese vendors have seized upon market momentum to grab market share,” says Ramon Llamas , Research Manager of Wearables, IDC. “China has quickly emerged as the fastest-growing wearables market, attracting companies eager to compete on price and feature sets. “In addition, multiple vendors have experimented with a broad range of products and applications. 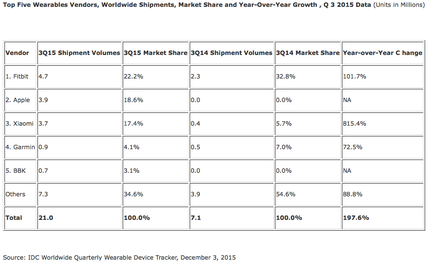 While there has been clear growth in the wearable market, there has been little sign of product cannibalisation. Smart watches have drawn increased attention to the market from the likes of Apple, Motorola, Pebble, and Samsung, but this has not dampened interest in fitness trackers. By the end of 3Q15, shipment volumes for both product categories increased sequentially and year over year, showing that, for now, the categories can co-exist and grow - this also provides end users with choice in terms of feature sets and functionalities, ranging from simple fitness tracking to smartphone-like experiences. “The bifurcation doesn't just exist in features, but also in price,” adds Jitesh Ubrani , Senior Research Analyst of Mobile Device Trackers, IDC. “The average smart watch or band came in at just over \$400 and the average basic watch/band at $94. Fitbit relied on its popular Fitbit Charge and Fitbit Surge models to maintain its leadership in the worldwide wearables market, and also saw continued growth within the Asia/Pacific and Europe, Middle East, and Africa (EMEA) markets. Equally noteworthy has been its fast-growing Corporate Wellness strategy during the quarter, which added North American retailer Target and its order of 335,000 fitness trackers for its employees. Target joins Bank of America, Time Warner, and more than 70 other Fortune 500 companies to deploy Fitbit devices to its employees. Apple posted a slight increase from the previous quarter, mostly the result of additional markets and channels coming on line. End-user attention has been going toward its entry-level and least expensive Sport line, to which Apple responded by introducing gold and rose gold models. In addition, Apple released watchOS 2, bringing native third-party applications to the device. Xiaomi's inexpensive Mi Band buoyed volumes higher during the quarter, with more than 97 percent of its volumes shipping into China. Volumes outside of China remain limited, although progress has been made in Western markets. Adding to Xiaomi's selection is its Mi Band Pulse, which added real-time heart rate monitoring and was released on Singles Day (November 11) in China. Garmin's focus on citizen athletes with wearables for running, golf, swimming, hiking, and aquatics kept the company well entrenched as the clear number four vendor worldwide. With a deep and broad product portfolio and multiple price points, Garmin has been well-positioned to cover numerous market segments and address the rising fitness tracker category with its Vivo sub-brand of bands and watches. Chinese vendor XTC, a subsidiary of BBK, beat Samsung for the number five position by 100,000 units in its worldwide debut. Like other Chinese vendors before it, XTC maintained its focus exclusively within China, and with just one device: the Y01, a children's phone watch.